Meet Unikitty! This week, Cartoon Network announced their new TV show will premiere on New Year’s Day. An animated series, Unikitty! follows the adventures of “the beloved character from The LEGO(R) Movie.” The voice cast includes Tara Strong, Kate Micucci, Grey Griffin, Roger Craig Smith, and Eric Bauza. Unikitty! premieres on Cartoon Network on January 1st at 6 a.m. ET/PT. Cartoon Network is raging in the new year with the premiere of Unikitty!, a new series produced by Warner Bros. Animation, and based on the beloved character from The LEGO(R) Movie. The sparkle matter-filled debut begins Monday, Jan. 1 at 6:00 a.m. (ET/PT) and six new episodes will rotate throughout the day. Fans can also watch the episodes across the network’s digital and mobile platforms including the Emmy Award-winning CN app and VOD. Following launch, a new episode will air Fridays at 6:30 p.m. (ET/PT) on Cartoon Network. · 6:00 a.m. (ET/PT): “Action Forest” – Hawkodile is the toughest action hero in the land, until his old rival shows up to take vengeance on him. Defeated and in need of help, Hawkodile must train Unikitty and the others into super muscle�y tough bros. And there’s only one place unstoppable warriors are made, the Action Forest. · 7:00 a.m. (ET/PT): “Kaiju Kitty” – When a giant monster attacks the Unikingdom, the gang fights back with Dr. Fox’s awesome new secret weapon: a massive mega robot! · 9:00 a.m. (ET/PT): “Rock Friend” – Unikitty discovers Puppycorn’s only other friend is a boring old rock. Encouraged to “make more friends,” Puppycorn takes her advice and decides to literally make a new friend out of the best parts of his friends. · 10:00 a.m. (ET/PT): “Kitchen Chaos” – After a workplace injury, Richard is unable to do his servant work. Unikitty and the others take on the task of one simple chore, clean the kitchen. This incredibly boring task taxes our heroes as they find every way possible to not do it. · 11:00 a.m. (ET/PT): “Crushing Defeat” – When Hawkodile develops a secret crush on Dr. Fox, he finds himself actually crushing down in size! Unikitty and the gang become his love gurus to help him confess his feelings before he shrinks away into nothing. As ruler of the kingdom, Unikitty has busy days full of royal responsibilities. 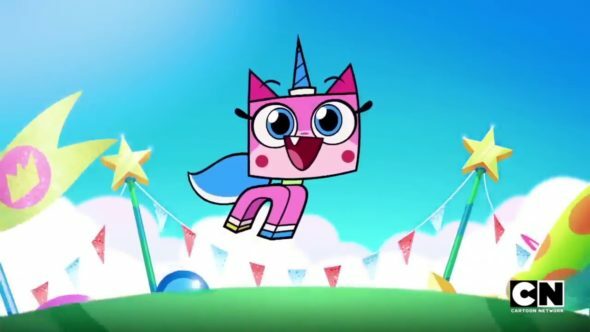 Unikitty is most interested in making sure everyone is happy and ridding the kingdom of negativity, but don’t misunderstand her optimism – she is one kitty not to be crossed. While she may be full of boundless energy and creativity, Unikitty is a force to be reckoned with if anyone gets in the way of spreading her positive vibes – especially if anyone makes her little brother and best friend, Prince Puppycorn, sad. Also living in the castle are Dr. Fox, the resident scientist, and Unikitty’s trusty bodyguard, Hawkodile. Through it all, Unikitty and her friends make sure that every day is the happiest and most creative ever. What do you think? Are you a fan of The LEGO Movie? Will you watch Unikitty!i? More about: Cartoon Network TV shows: canceled or renewed?, Unikitty, Unikitty: canceled or renewed?